The Stanley Ferry01924 290596work Restaurant - PubThe pub is located in a beautiful setting alongside with the Aire & Calder canal. Forming part of the Trans Pennine Trail we provide drinks, light refreshments and main meals to many walkers, cyclists, local people and visitors from afar. We were voted Punch Managed Pub of the Year 2007/2008 & 2008/2009 from over 2000 punch managed pubs and were voted best Pub in Bloom 2007 by Wakefield Council. We provide great pub food based on a 2 for 1 basis, which means you only pay for the dearest meal and the second meal is FREE!. Dining areas are available inside and out (depending on weather). The restaurant can cater for 175 people and outside caters for another 80 people. The seperate Wacky Warehouse provides a great place for the young ones to burn off energy and also provides coffee and snacks. 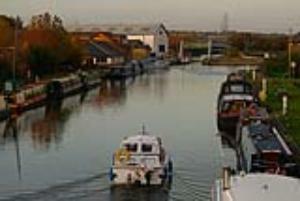 The pub is located in a beautiful setting alongside with the Aire & Calder canal. We have alot of visitors to the famous Stanley Ferry Aquaduct on which the Sydney Harbour Bridge was designed. Overall a great day out and a great experience. Hot drinks in the Wacky Warehouse are available 9.30am to 9pm Monday to Friday and between 11am and 9pm Saturday and Sunday. Pub food is available between 12 noon and 9pm Monday to Thursday, 12noon to 10pm Friday and Saturday and between 11.30am and 9.30pm on Sunday. Play area last admissions are 8-8.30pm and it closes at 9pm. On Christmas Day the bar is open 11am to 3pm and food is bookings only. Jnc 30 of the M62 and head for Wakefield. After 2 miles take a right turn signposted Stanley Ferry Marina and the pub is on the right after three quaters of a mile. Nearest train station is Normanton.